A salad green that has small dark green, velvety leaves with a rich, sweet flavor, similar to hazelnut. In addition to salads, this green can also be steamed and served as a vegetable. 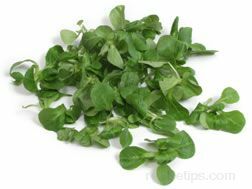 Mâche is grown in France, Holland and the United States and is also known as Corn Salad, Field Salad, Field Lettuce, Lamb's Lettuce, or Lamb's Tongue. It is often found growing wild in fields. Mâche is available throughout the year in gourmet produce shops. Select bunches that are thick and have fresh, bright colored leaves. To store, wrap in plastic and place in the vegetable drawer of the refrigerator and they should remain fresh for two to three days.